This alert reminds nail gun users to prevent their guns from inadvertently discharging when they’re using them. It also reminds them to prevent nails from inadvertently ricocheting and hitting persons or penetrating other surfaces. 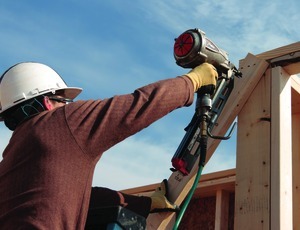 Nail guns are a high risk tool widely used in the residential construction industry. Numerous incidents involving their use are reported each year. These incidents usually involve serious injuries to those using or to those in the vicinity of their use. • When in bump fire mode, the nail gun can be inadvertently discharged due to contact with an object such as the human body. A nail is fired when the operator maintains pressure on the trigger each time the contact tip is depressed. • Inadvertent ricochets or penetrations can occur when a nail is fired into a hard surface such as a wood knot, another nail, or other hard surfaces and results in the nail being bounced or projected off in an unpredictable direction. • Young or inexperienced workers should only use nail guns under strict supervision as statistics indicate they are the most at risk. • Where possible, use the single shot type/mode. • The nail gun is maintained in accordance with manufacturer’s specifications. • Users are trained and instructed in their safe use. • Users should be competent to use the nail gun they use, whether it is a single shot or bump fire type. Competence should be verified through assessment and regular reinforcement. • Appropriate personal protective equipment such as eye and hearing protection is worn. • The timber surface should be inspected for cracks or knots prior to their use. • Never place your finger(s) on the trigger when moving between work areas (e.g. up/down ladders). • Nail guns must never be pointed or fired in another person’s direction. • Take regular breaks from their use to address the ergonomic risks associated with their long term and repetitive use. • Areas where nail guns are used are to be isolated from other workers and clearly defined with physical barriers and signage. 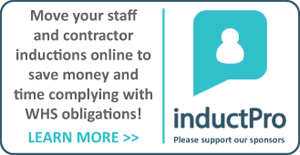 • The Work Health and Safety Act 2011 (WHS Act) requires a person conducting a business or undertaking to ensure, so far as is reasonably practicable, that safe systems of work are provided and maintained and that all workers are provided with the necessary information, training, instruction or supervision. • Nail guns can be powered by gas canister or pneumatic. There are two main types/modes of nail guns used:Single shot – requires finger depression of the trigger for each nail fired. • Bump fire – the trigger can be held down with a nail fired each time the nozzle comes into contact with an object. Contact us here for assistance or queries!